Saying goodbye is seldom a nice experience, but when the time to part comes, saying goodbye is still better than remaining silent. Cairo Live Event Guide has been online for five years. During this period of time few days have passed without me thinking about it, writing on it, receiving mails about it. Even after my departure from Cairo two years ago it has been, though necessarily less conspicuously, an integral part of my life. But now I have come to a point where the distance and other obligations prevent me from giving CLEG the amount of time and dedication it needs in order to continue to be the blog I wish it to be. So, after a lot of thinking, I decided that it was better to close it, rather than to let it fade away. Cairo Live Events Guide has been a work of passion, a passion for a city and for its artistic richness. It has contributed to bring Cairo’s cultural life closer to my heart and, given the number of readers and subscribers, I assume to the hearts of many other people too. That was the sole aim of it. I would like to thank all artists and event organizers that have collaborated with me during these years and wish them all the success they deserve. The blog comes to an end, ... the passion remains. The two Cairo based bands HIGH ON BODY FAT and SALALEM will perform on Thursday September 26, 2013 starting 7:00 PM at El Geneina Theatre in Al Azhar Park. Ahmed Safi el-Din and Marwan Imam are HIGH ON BODYY FAT, a musical comedy duo hailing from our very own Cairo, whose distinctive style involves parodying popular songs and replacing the lyrics with humorous Arabic or English ones. Formed in 2005, SALALEM band benefits from the diverse influences of its members and its unique formation involving three guitarists, a formation unusual anywhere in the world, and almost unheard of in the Middle East. The end product is simple groovy tunes fused with sarcastically humorous Egyptian lyrics that have come to be their distinguishing quality. Please Note that smoking, eating and drinking are prohibited inside the theater. The Makan (Egyptian Center for Culture and Arts) presents a concert of the TELEPOETIC BAND on Tuesday September 24, 2013 at 8:00 PM. 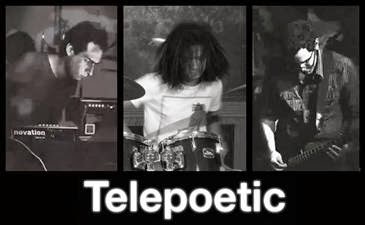 Telepoetic's music is an original mixture of experimentation resulting from the clash of the approaches of a trio of musicians. It is melodic deformed audio material combined with improvisations that walk over a strong tight acoustic construction. To watch a Telepoetic performance, click here. Tickets price: 30 LE per person, 20 LE per person for families. Tea and Karkade are served. MakAn: 1 (Not 1a) Saad Zaghloul Street, 11461, El Dawaween, Cairo. Over the span of two weeks, the festival presents a diverse program of experimental film and video art from around the world. The selection was made from hundreds of received applications to highlight recent experiments in these fields. The screenings are followed by special sessions led by guest filmmakers and program curators to present their work and discuss it with the audience. 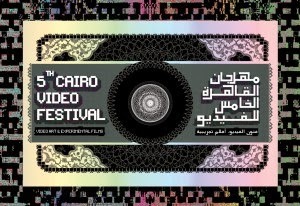 The 5th Cairo Video Festival seeks to become a platform for all those experimenting with the mediums of film and video. The festival is organized by MEDRAR, a space for young artists to host conversations on the state of contemporary art, initiate and carry out collaborative projects and engage in a process of collective learning. Mashrabia Gallery invites you to attend the opening of the exhibition Made in Lebanon by MARWA EL-SHAZLY on Sunday September 22, 2013 at 7:00 PM. "I am speaking about the Lebanese pop divas, those who are being produced mainly in Beirut but also in Cairo and represent one of the cultural prides of Lebanon. The basic feature of this industry is the combination of regional Arabic tunes and the elements of international pop music. The themes tend to focus on longing, sorrow, passion and all kinds of dreamy romantic love issues. Therefore the most frequently used words are “my love”, “my sweetheart”…etc. which comes from an unrealistic world, probably as a mean of resistance or a getaway or to satisfy irreplaceable human needs which enriches the idea of dream and hope"
The exhibition runs until October 17, 2013, daily except Fridays from 11:00 AM to 8:00 PM. Phone 02 25784494, mobile 0100 1704554. Opening hours: Daily except Friday 11 a.m. - 8 p.m. This post should have appeared 10 days ago, but somehow it did not; I apologize for that. CLEG will take a (quite long) rest and will be back in October. Wish you all a happy summer and hope to find you again in a peaceful and more stable Cairo. On Sunday August 04, 2013 at 9:00 PM the Palestinian singer SANAA MOUSSA will perform at the Geneina Theatre in Al Azhar Park for the closing night of Mawred's Hayy Festival. Sanaa Moussa was born in the Palestinian village Deir Al-Asad in the Galilee. Her father is a well known musician and singer who excelled at singing folkloric songs of Syria, Egypt and Iraq. That was the trigger for Sanaa’s connection to classic Arabic music and in particular the Palestinian folk. 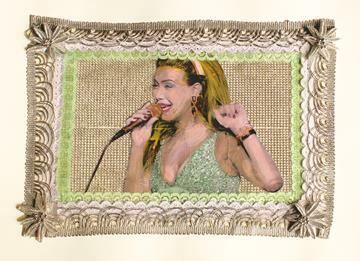 In 2003 she received training and performed at the Oriental Music Center. Startin in 2004, she has been performing classic and folkloric songs at several festival across the Arab World and Europe. 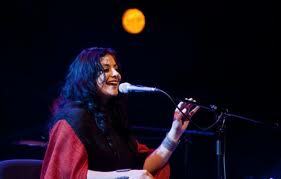 In 2008 she founded her own band and called it “Naw Athar”. The band presents folkloric songs in new arrangements while maintaining their oriental flavor.